Ladies & gentlemen, please fasten your seat belts as you might experience some factful turbulence ahead! Travel for us is all parts of human emotion combined, it ties into it a sense of wanderlust, a sense of purpose, fear, excitement and happiness among other emotions. A famous saying beholds, “Blessed are those who travel, as they will have adventures.” Whatever your reason to travel might be, booking for the journey and back and the hotel stays is an experience all of us have gone through. That itself brings a ton of emotions on the surface: nervously keeping track of ticket prices so that you book your tickets well in time, anxiety jitters of last minute bookings and booking in tatkal is a bigger challenge like no other! It is no wonder that the industry built around this whole experience is vibrant, ever changing and always primed for disruption. It is this beauty of the experience that spurs all firms on to revolutionize this experience. The travel booking industry has come a long way. Remember the days, when local travel agents ruled the roost to to the current day where travelers are spoilt for choice for both price and offerings provided by various websites and apps? They range from travel aggregators which combine flight + hotel bookings from different vendors in one place, to specialized aggregators that only allow travelers to book train, bus or other kind of tickets to standalone websites by individual vendors. PayU is the largest payment gateway firm in India allowing businesses to collect payments online. This has allowed PayU to have a ringside view as the travel industry has evolved in the past few years. With its deep penetration in the sector, PayU has a wealth of insights into how travelers behave when it comes to booking their travel. Below is an attempt to uncover those insights and unravel how India travels. This covers data across major travel aggregators and the most popular standalone vendor websites. PayU accounts for 70% of the travel transactions processed online in India giving the data a diverse richness and accuracy. The trend in both: ‘amount spent on bookings’ and ‘the number of transactions’, increases as the year progresses. Despite all our planning, it is evident that Indians are last minute planners. 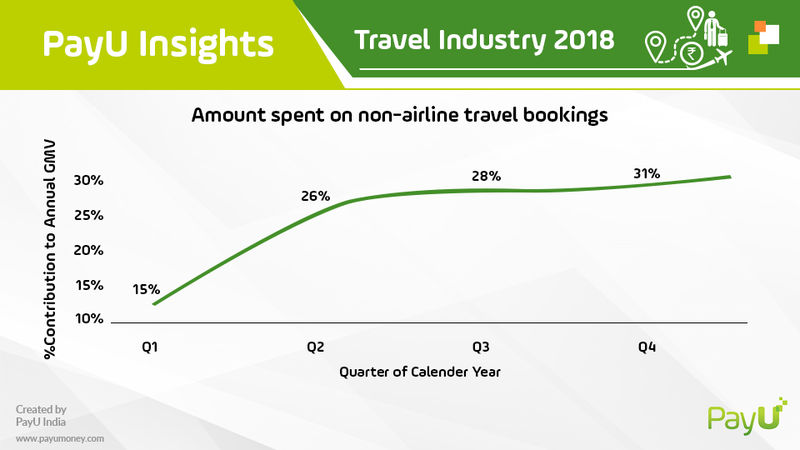 Travel bookings spike in the last 2 quarters when, the holiday season picks up with a flurry of festivals such as Diwali, Christmas and the New Year. 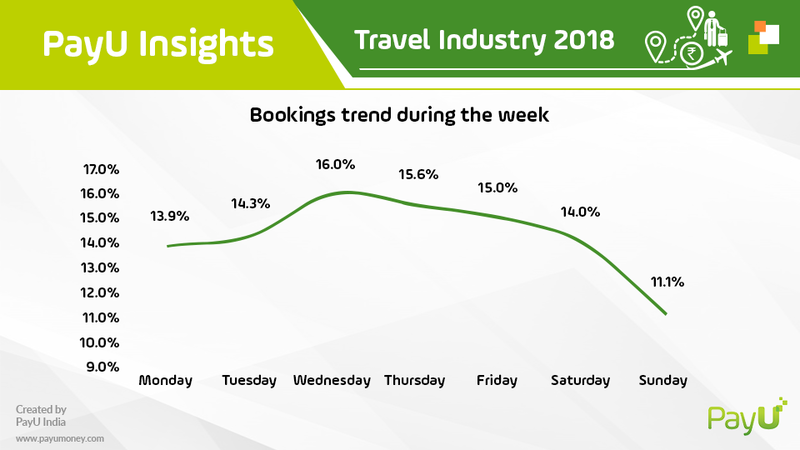 A stark example is August, for both Airline and non-airline merchants, the bookings are higher because of public holidays (Independence Day, etc) and a couple of festivals are just around the corner. People travelling through flights/airlines are more likely to book ticket on an immediate basis (previous or next day). For non-airline travelers, in case of festivals at least this duration increases to 2 days. 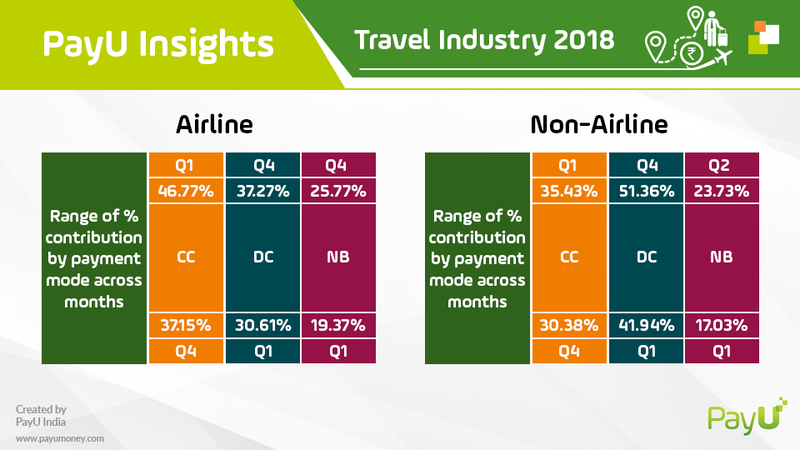 What is also interesting to note that the non-airline bookings rises in the last quarter. The last mile connectivity becomes important as, Indians want to be home (during festivities) which have good road and rail connectivity to major metros. The last 2 quarters also represent the season of long weekends and the frosty weather which results in a spike in travel bookings. 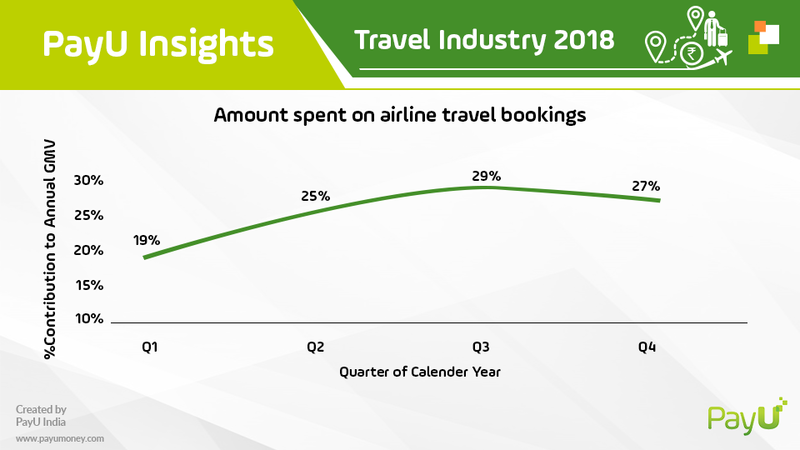 It clears that the first quarter which sees no major holiday, marks the exam season for kids and is the closing quarter of the financial year, sees the least number of travel bookings. Further, the number of bookings peaks up in the year’s second quarter with the rise in professional travel bookings (as the new financial year kicks off for firms). So next time you plan that trip with your buddies to Goa in December or with the family during the summer holidays, make sure to book early to avoid the surge in prices that last minute bookings bring along. Another really interesting trend to look at is, when do Indian travelers freeze travel plans? Is it during the day or the millennials booking travel at night; which is the dominant and emerging trend. Also when in the week do Indian travelers start planning and booking for travel purposes? 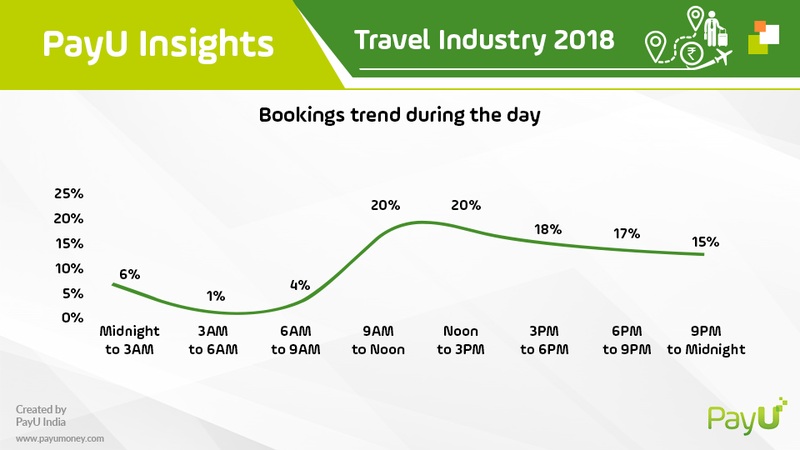 This either indicates that travelers tend to make bookings during the day from offices or a wider trend that the travel agents still act as aggregators to book tickets for customers. The trend seems to persistent for airlines or non-airlines bookings. As observed, majority of bookings happen in the middle of the week further minimizing as the weekend dawns. Indians mostly pay using Credit Card (CC). 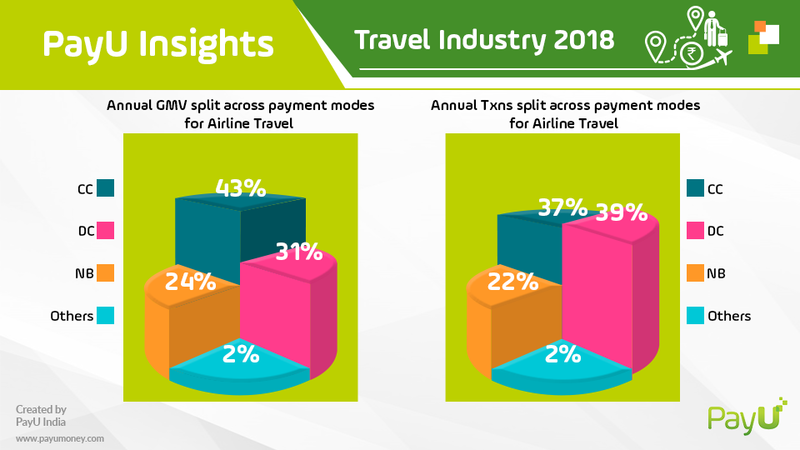 This is not surprising, given the high number of exclusive tie-ups airlines have with card issuers for offering co-branded card. Most CC transactions are incentivized by linking purchases to miles on select airlines. But, it also shows that Indians are not shying away from traveling on credit. Debit Card (DC) transactions offer an interesting mix. Incase of volume processed using debit cards, it actually goes beyond CC usage. Whereas, the number of transactions show a very interesting trend that, Indian travelers shop more for travel with debit cards. They are willing to spend more money on credit card transactions, though transaction volumes are lower there. Net banking is the third highest, but there the number of transactions processed closely mirrors the amount being spent overall. 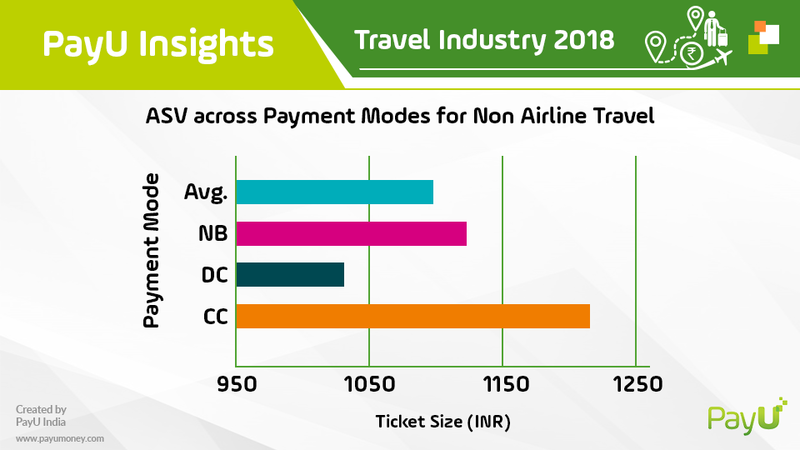 Another trend is the much lower ASV on debit cards compared to credit cards across airlines and non-airlines bookings. This is even lower compared to the average trend in ASV for all transactions. Even across non-airlines bookings, the trend for bookings made via credit cards remains high. Debit card emerges as a winner, indicating that it is not transacting on credit that attracts travelers. The eco-system of rewards introduced by issuing firms around credit cards pushes them to use credit cards way higher than they would do for other kind of bookings. 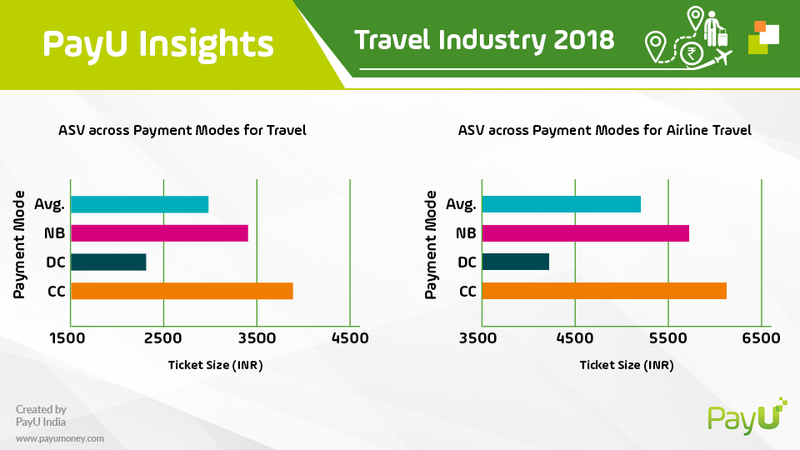 The fact that the ASV for credit cards is the highest even for non-airline bookings (despite low penetration in the segment) indicates travelers se value proposition in credit as a payment option. Another interesting parameter to observe is the best time credit card/debit card/net banking transactions occupy a significant market share. It is clear that credit cards have a maximum share in the first quarter of the year when it comes to both number of transactions and actual volume spent through the PayU platform. Whereas, the last quarter has the lowest share for credit cards. We had seen earlier that the growth trend is good for no-airlines bookings in the last quarter. This points to the fact that debit card usage is maximum in terms of share of transactions in the last quarter. People prefer to reach home by any possible means during festivals and holidays. Lower cost transactions go on the rise increasing the usage of debit cards for non-airline transactions. 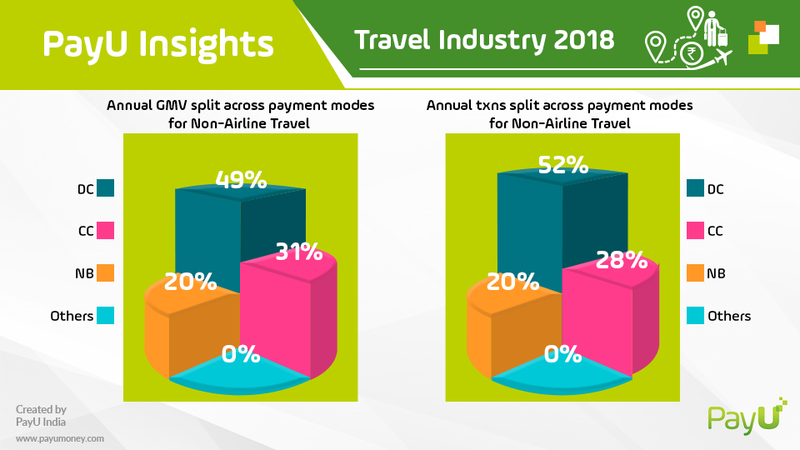 So a few points are very clear about Indian payment behavior as far as it comes to traveling. It is interesting to note that the trends bust a lot of myths. Are Indians averse to credit? No, as it seems. Are Indians booking travel themselves? Not really. Maybe the Indian customer needs more education and faith building. Indians follow very conventional habits when it comes to booking tickets during the week and during a day. With new payment instruments such as UPI coming in, it will be interesting to how traveler behavior changes as the days pays by. Does more convenience in paying widen the net of customers served online? Or does the usage of online aggregators become more democratized? Well, only time can tell as it moves on its steady march, but we will be here looking at the trends as the weeks and months pass by, so stay tuned! Take a glance at the excerpts of this article covered by leading Indian news dailies.